Does playing as a lounge singer wielding a greatsword while cutting down aristocrats and their robot servitors in a cyberpunk world sound intriguing enough for you? Maybe if the sword can also talk to you through your controller? All of that and my love of the game Bastion was enough for me to pick up this game day one. 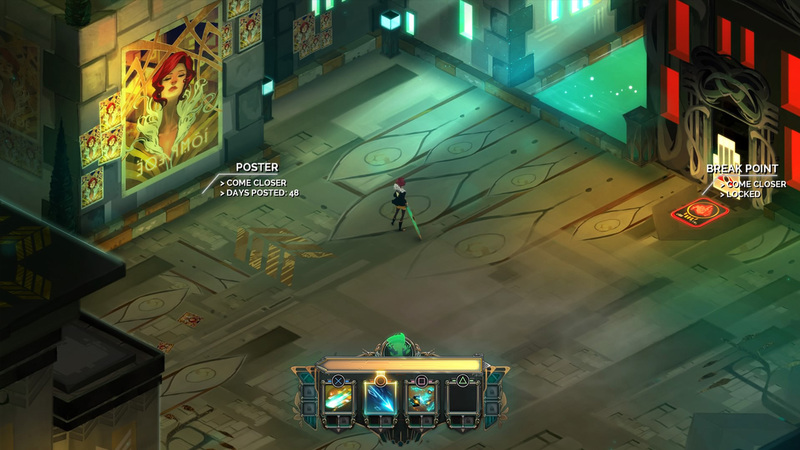 With the success of Bastion, Supergiant Games decided to incorporate some similar designs within Transistor. Their use of an isometric view, a focus on narrative and music, and action combat roots can all be seen in this spiritual successor. This is by no means a detractor though, on the contrary I think they took a good thing and just expanded on it. Again, similar to Bastion the backdrops are wonderfully crafted and look as if they are just painted right onto the screen. The city consists of skyscrapers made from steel and glass which are offset by the occasional theatre or fountain. This disconnect between beauty and functionality, ornate and sterile is a theme that permeates throughout the game. You are really given the feeling that you are travelling through a computer program and for me it personally brought up old memories of the TV series Reboot, only with a little less comedy and much better voice acting. The game starts with a singer named Red nearly being assassinated. At the last second an unnamed man steps in the way and takes the blow. In the blink of an eye he is left lying on the ground with a giant sword (The Transistor) embedded in his chest. 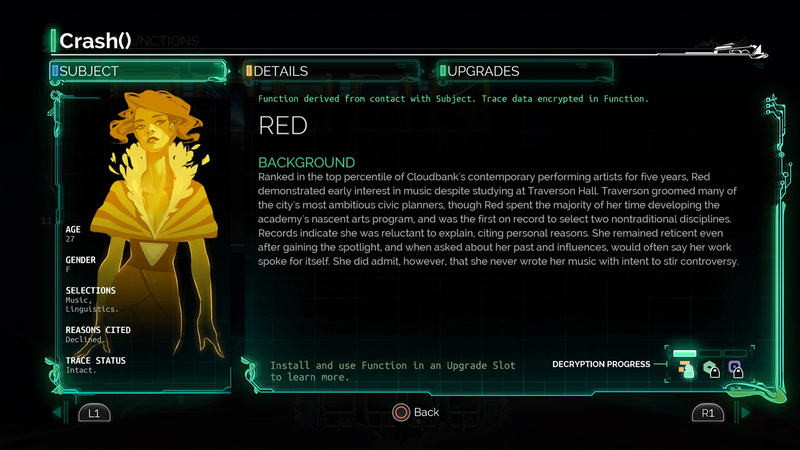 The Transistor had taken Red’s voice and the life of the unnamed man. As Red picks up the sword she hears the man speaking to her through it. 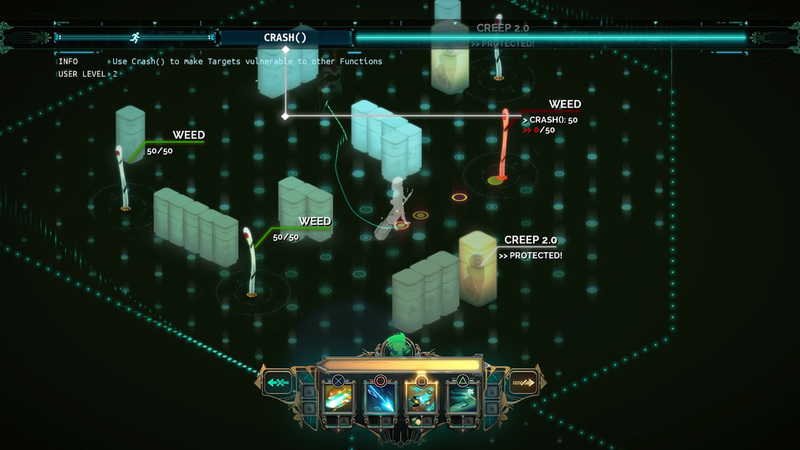 The rest of the game is narrated by the man adding to the dichotomy of feeling both separated and connected to the Transistor. 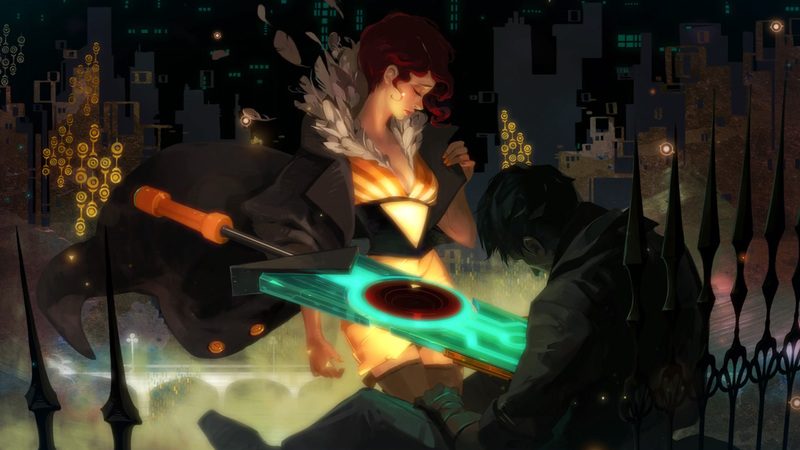 The Transistor is centric to how the game functions as both sword and shield in combat and how you interact with objects in the world. I won’t get too much into the story since it is part of what makes the game so good. Essentially there are baddies called ‘The Process’ which are restructuring the city (Cloudbank). These automatons are controlled by an organization called the Camerata, a group of high society citizens who are bent on repurposing the city to fit their needs. I’m often critical on how much or little story is given and how it is delivered, in this instance the balance between what is told and left untold works well to add to the mystique without leaving you completely in the dark. Characters are well designed and I love how they are shown in their dossiers. Each has individual likes, dislikes, attitudes and attire. Even if you only hear about one of them in passing you really feel connected to who they are and where their motivations lie. Even a character with no voice can be given one through their actions as well as the bits of text found on consoles located throughout the city. Combat is done in two ways; Abilities called functions can be fitted into 1 of 4 slots and are mapped to your face buttons, these functions can be used in active combat as well as the strategic Turn() mode. During Turn() mode time freezes and you’re able to move around and use abilities while draining an action bar. If you are not happy with your decisions before executing you can rewind and change what you want to do, this allows for a more strategic approach to each encounter. The action bar slowly refills during the active combat phase and you will be unable to use most of your abilities during this time. Function can also be slotted as passive support bonuses and to other combat abilities to change how they work. This customization proved especially useful for the challenges found in your hide away. And now we get to the good stuff. Music makes the game, not only thematically since after all you are a singer but also as a driver of emotions. Each score suits its situation and has an impact on adding to the feelings of the moment. There are tracks that are sad and somber, panicked action, and even a soft relaxing one while you take the backdoors to your hideaway. Voice acting is also well done and the actors really bring the characters to life, especially the Narrator. A single play through is not terribly long but there is an included recursion mode which allows you to start the game over keeping all your collected abilities. You’re even able to obtain them a second time to make some very interesting combinations. Challenges, as I mentioned earlier, become available as you play through the game, which pit you against predetermined enemies and objectives. These challenges require quick thinking and strategy as the game also limits which abilities you have available to you for them. In summary, Transistor is a fantastic game. It appealed to me both visually and musically and I found myself playing the game start to finish and even recursion mode without putting it down. At its budget price I can recommend it to anyone who likes a good story and is willing to get emotionally attached. As for Supergiant games, they have won a place in my heart with two back to back critically acclaimed games in Bastion and Transistor and I will be looking forward to the next game with their moniker. July 12, 2016 in Josh Pang, PC, PS4, Review.